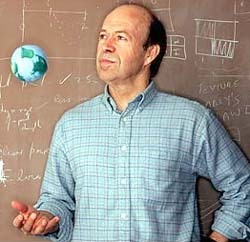 Yes, NASA’s James Hansen is the ultra-global warming alarmist. Yes, he has called for war crimes trials for global warming “deniers.” But right now, Hansen should be a our best friend. Like us, Hansen opposes the Waxman-Markey bill. He calls it the “counterfeit climate bill” and likens its cap-and-trade provisions to a Ponzi scheme. Sure, our reasoning differs from Hansen’s — we think Waxman-Markey is a junk science-fueled Marxist-socialist political power grab sugar-coated with a corporate welfare honey pot, while Hansen believes that Waxman-Markey is too little, too late in terms of stopping the dreaded global warming — but we do have the same goal for now. If Hansen gets his way and Waxman-Markey is made more stringent, then the big businesses that have so far enabled the bill will withdraw their support. Without their support, Waxman-Markey is dead. Yes, we would like Waxman-Markey to fail for the right reasons, but if it fails for the wrong reasons, that also works. Eileen Claussen, head of the green Pew Center on Global Climate Change, told ClimateWire that she wished Hansen would stay out of the politics business. What is he thinking? Who does he think will vote for [a more stringent clampdown on greenhouse gas emissions]? Apparently Hansen’s meddling in politics was OK as long as the greens found him useful. Now, he’s just a thorn in their side. This entry was posted on	July 14, 2009 at 10:42 am	and is filed under Fighting Back. What next? First Ralph Nader, now Hansen turns against the Leftist. Mayby they are not the useful idiots I took them for. Waxman – Markey should go down in flames; so should their bill. The main output of the bill is the creation of several new billionaires, Gore being one,and the poor house for the rest of us. I also can’t wait to see how “The One” is going to control the weather to keep the global temperature rise under two degrees (does that also mean keeping the temperature from falling more than two degrees). The only sensible attendees of the G8 conference was China and India. They pretty much gave the rest of the world the finger. Being a pragmatic bear, I say ANYTHING TO KILL WAXMAN-MARKEY. And as an aside, can anyone figure out WHY space “technology” has basically not progressed to any significant degree in over 40 years. Could NASA just be a big, expensive misdirection ginned up by the NWO types while they in fact have technology from people like T.T. Brown, and space travel for them is a breeze? Then we get to “Alternative 3”. Suggest a trip through “Casebook for Alternative 3”; draw your own conclusions, however. Perhaps if they can do “Alternative 3” then, they don’t need or want the earth, but spoiled brats that they are, they will make sure nobody else gets to use the earth either. So many things twist and weave together, but I fear it all spells GENOCIDE for most of us if something is not done soon. It is sick sick world we live in when we have so called educated people going to try and change something that can not be changed, any way over the long term it can not be changed , no matter what gas we do away with the weather will be the weather and do what it wants to do . all one has to do is watch a green presentation on volcanoes and they will tell you that we must just sit back and let the volcano do what it wants and stay out of the way,that we are powerless to stop it , that would be good advice for all who believe that money will change anything except who is holding the money. Hansen is correct, the Waxman waxing business and consumers bill will do nothing to change weather but neither will a more stringent bill, so he is half right. There should be a bounty on environmentalists , pure and simple . Maybe a fifty dollar bounty would be enough to stop them,. (humor) I in no way condone the killing or incarceration of any one . just a thought to express my growing discomfort with green people. It is sick sick world we live in when we have so called educated people going to try and change something that can not be changed any way over the long term it can not be changed , no matter what gas we do away with the weather will be the weather and do what it wants to do . all one has to do is watch a green presentation on volcanoes and they will tell you that we must just sit back and let the volcano do what it wants and stay out of the way, that would be good advice for all who believe that money will change anything except who is holding the money. Hansen is correct the Waxman waxing business and consumers bill will do nothing to change weather but neiother will a more stringent bill . Hansen is emotionally unstable. His “forcing” concept requires every molecule have a tiny pilot providing intelligent control, Satanic or Divine intervention. CO2 is a trace gas in the atmosphere and by definition insignificant. Water vapor is the principle “greenhouse gas” with 1500 times the effect of CO2. Controlling carbon with regulation and taxes is the seeking of politcal power and nothing more. Is there a scenario in which they could destroy each other? Kinda like in the comic books? I absolutely support James Hansen in his quest to kill Waxman-Markey. He is, in this instance, completely correct. As an “anti-global warming bill” the thing stinks. It’s worse than worthless. I don’t care which side of the debate you are on, Waxman-Markey does NOTHING, beyond raising costs and encouraging corruption.